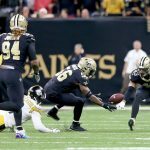 If the standard is the standard, then the 2017 Pittsburgh Steelers fell very short of reaching the standard that has been set by six Super Bowl winning teams in franchise history. In a season that saw them win thirteen games, they would lose three during the regular season that were strange to say the least. There was the Chicago Bears game, where they were more focused on how to handle the national anthem than play a football game. The five-interception game to the Jacksonville Jaguars, that had Ben Roethlisberger questioning if he still had “it”. Then finally it was the “what is and is not a catch in the NFL” loss to the New England Patriots. Even through all that, they won their division and earned a bye in the AFC playoffs. That would give them the opportunity to avenge an early season loss to Jacksonville. 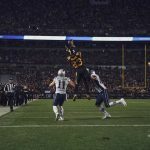 Even before the game was set, some Pittsburgh players were already talking about playing New England again, while others were looking for revenge on the Jaguars. Hopefully those on the roster next year learned to focus on the task at hand, and be careful what you wish for. Jacksonville came out of the gate on fire and jumped out to a 21-0 lead early in the second quarter. All three of those scores would come via rushing touchdowns. Two from Leonard Fournette and one by T.J. Yeldon. The Steelers would get on the board on a Roethlisberger touchdown pass to Antonio Brown from 23 yards out. A Roethlisberger fumble would lead to a 50-yard touchdown return by Telvin Smith. Roethlisberger would end the half with a 36-yard touchdown pass to Martavis Bryant. The only points of the third quarter came when Roethlisberger would connect with Le’Veon Bell on a 19-yard touchdown pass. Pittsburgh would trail the Jaguars 28-21 going into the fourth quarter. Jacksonville would retake that 14-point lead with 10:34 left in the game on another rushing touchdown from Fournette. From here it would be a back and forth game of these two teams trading touchdowns, until Josh Lambo kicked a 45-yard field goal to put the Jaguars up ten. A Steelers touchdown with one second left, would close the gap, but ultimately not be enough in a 45-42 loss. If you would have told me before this game that Pittsburgh would score 42 points and lose, I would have asked how much have you had to drink? The defensive game plan was horrible and poorly executed. The two turnovers by Roethlisberger were also a hindrance, but the play calling on two 4&inches plays were just mind boggling. Throw in a poorly timed and executed onside kick and it is easy to see that the Steelers had no business winning this game. While I would love to see some coaching changes take place during this offseason, Pittsburgh has a history of being loyal to it’s coaches, sometimes to a fault. Roethlisberger is said to be coming back next year, and Bell will most likely get the franchise tag once again if not signed to a long-term deal. He says he would sit out or retire, but I can’t see him saying no to $14.5 million dollars. Personnel wise the offense should be good. The defense will need to find a linebacker replacement for the injured Ryan Shazier and the secondary still has a lot of improvement to do, which seems to be a never-ending story for this team for the past twenty years.